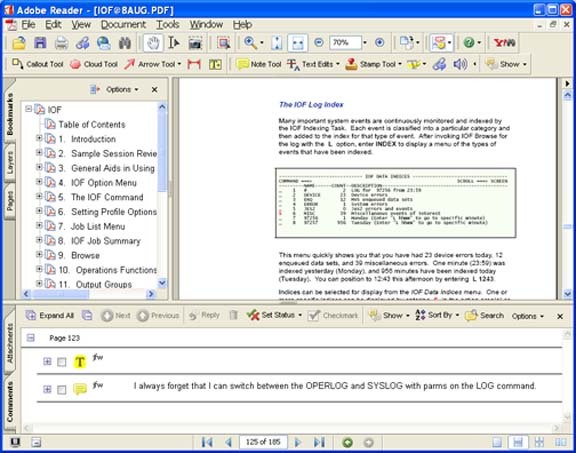 IOF documentation is available in Adobe PDF format. 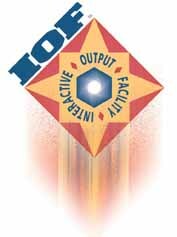 IOF manuals can be downloaded from this web site. Beginning with release 8A manuals, several new Adobe features that may be unfamiliar to users are being exploited. This newsletter describes ways to use the new features. 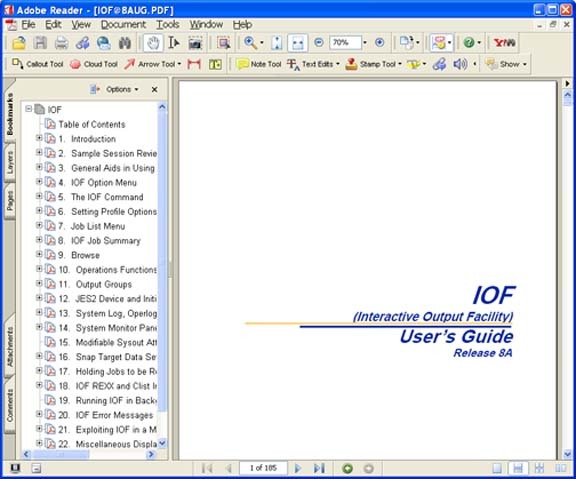 The release 8A IOF User's Guide and Installation Guides are generated so that the Table of Contents is automatically bookmarked. The Bookmarks window is displayed by default to the left whenever these manuals are selected. Section and subsection headers are also bookmarked in many cases. There are many internal links within the manuals that allow you to jump directly to a referenced section by clicking on the link. To return to the previous position, use ALT LEFT ARROW. At the top of the Adobe window you should see the Commenting Toolbar. 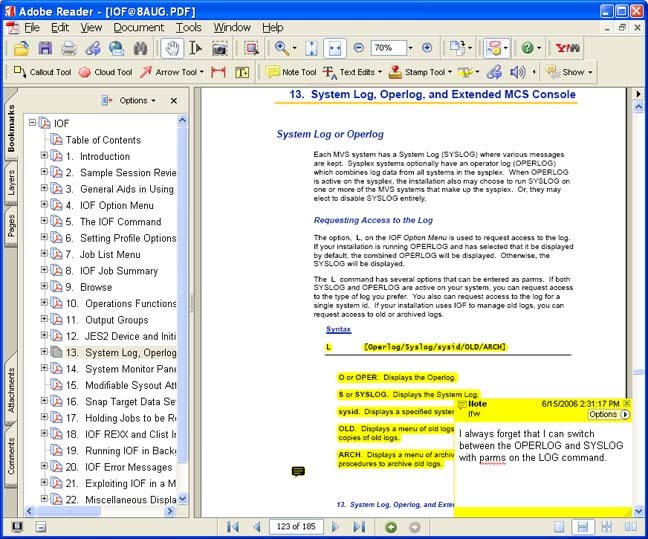 If you have a private copy of an IOF manual, this toolbar can be used to make notes and highlight sections of the manual. The Note Tool and the Highlighting Tool are the most useful tools on this toolbar. Click on the Note Tool and then click on a place in the manual where you would likt to post a sticky note. Then type your note and close the note if you like. The Hilighting Tool (left leaning T icon) has options to highlight text, cross-out text, or underline text. Select the option you prefer. Then select text from the manual by dragging the mouse over the text. You can optionally add a note about the hilighted text. Assume you clicked on chapter 13 in the Bookmarks window to the left to the Adobe screen, then scrolled down to the LOG command syntax diagram. Then you used the highlighting tool to highlight the syntax description, and used the Note Tool to make an additional note to yourself. Your screen will then resemble the screen shown below. The lower left corner of the Adobe window has the Comments tab. Click on this tab to open the Comments Window which shows all your notes, comments and highlights. You can then read your comments from the Comments Window or click on an item to jump directly to that item in the manual. Commenting and highlighting features require Adobe Acrobat Reader Version 7. If you do not have version 7 you may see a pop up panel like the one below. If you see this popup you will not be able to use the commenting features, but all other features of the manuals should function normally. Click on the SAVE icon or use File/Save or File/Saveas to save your notes and highlights. The next time open this manual your notes and highlights will be restored. Note that you must have a private copy of each manual you want to markup.